WEAL is an acronym for the features in a landscape characterized by water, energy, air and land that sustain wildlife or settlement. The landscape of the Weald, southern England. Envision weal as a set of component parts. Weal is the Middle English word for forest; the Weald was a forested portion of the English downs south of London. 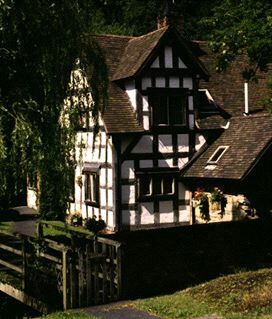 As this half-timbered house suggests forests were essential for construction, tools, fuel and aesthetic adornment. L stands for the landscape. WEAL is meaningful because it is derived from the same root as our word wealth. Also in the Middle Ages "weald" was used as a reference to forested landscapes. The forests were sources of wealth for commercially successful Englishmen before the coming of the industrial revolution in the 18th century because everyone depended on a variety of woodland plants. The home or homestead is the English equivalent of the Greek word OIKOS, for household from which we drive the word ecology. 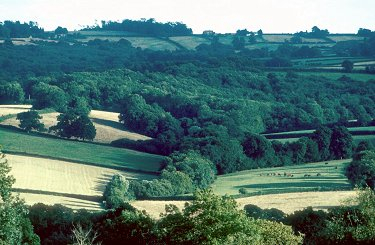 Woodlands such as these in the weald were literally sources of common and personal wealth because the forests provided water for all communities and the timber which individuals could use to shelter themselves, use for fuel to cook and warm their dwellings, and make artifacts, furnishings, utensils, and medicines. Forests were a renewable feature of the landscape that sustained civilization. 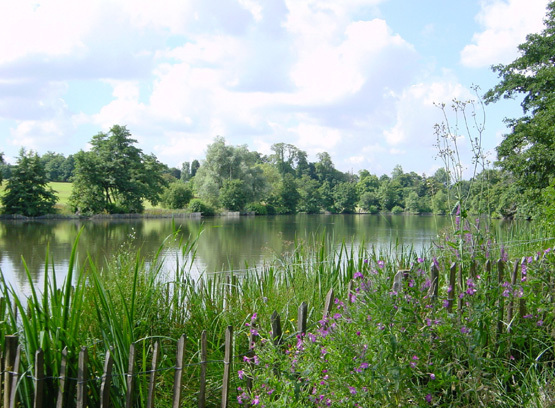 A lake in the weald countryside. Forests and water are a necessary partnership; you can't have one thrive without the other. An example of weal as applied to the Columbia River.